True, but they're only screenshots, I want CGs! You can make out Yoshi's mask, it actually looks pretty good on there. What's in this picture? 2 times Kilik's name? Arts instead of in-game faces? Di : What's in this picture? 2 times Kilik's name? Arts instead of in-game faces? It's a shot from the select screen in the newly released demo. You can only pick a few characters, so the rest are shown as artwork. BTW: Nice combo vid. First one I've seen of Soul Calibur 2. I've got the info that Yoshi received a lot of Tekken 5 moves. Including the Flea slide and... Dragonfly. He also no longer has WS Knee, so the guess up 1+AAA, sweep_or_juggle is gone. If it's the case, then I'll play him. The more Tekken-like Yoshi, the better for him. It's not that simple about 1AAA, Tenshi, because there's always enough time for the opponent to attack Yoshimitsu before he does WS K (i15) or FC 3K (i17). Also both attacks are mids, so 4G option is always possible (of course we can delay attack). IMO the best option here is SS (and then for example 22_88B, 22_88A- both for CH- or throw), WS B (crushing properties) or RCc into 1A. Something new about Flash? <MD>A+B,K is still NC? 4K, guaranteed when released during the first frame of UB? Tenshimitsu : I've got the info that Yoshi received a lot of Tekken 5 moves. Including the Flea slide and... Dragonfly. He also no longer has WS Knee, so the guess up 1+AAA, sweep_or_juggle is gone. May I ask, where'd you hear this? Di, at Playstation Experience'05 there will be REALLY the SoulCalibur 3 tournament! LOL!!! I haven't ever seen that game and they're making a TOURNAMENT?? So Qoora has best chances. He told me that his chars are Yoshi and... Setsuka. What bothers me is that there will be probably no Tekken tourney. Unfortunately I'm not going to PE- Saturday is my big day of learning (mathemathics from 9 to 12 and chemistry from 14 to 18). Hey, you all haven't seen Soul Calibur III Yoshi yet? I've found some leaked images on a forum, I'd be glad to show you all the link! These pictures are in Manjikai gallery. Oh, sorry. I got confused. See, I was reading the second page thinking that tohse were the latest posts, and all I read was that no one had seen SCIII Yoshimitsu yet. Eh... sorry, just tryin' to help. And thus far, the only cool costume he's had in SC was in SC1, the samurai'ish costume. That's very good-looking. By the way, has anyone noted that Tekken and SC Yoshis share not only the same vocabulary, but certain acts, too? In SC2, Yoshi stands on one foot in the select-character-scene, and in T5 - Yoshi vs. Raven - as he says the "Rikisen funt?! ", he stands alike. Besides, the SC Yoshi seems quite lively (he moves a lot when speaking and etc. ), and in T5 Yoshi acts the same. By the way: Is it just me, or does this look a bit like Yoshi's SC3 mask?? Why is Yoshi all of a sudden an aztec? Ive come to expect some things that are...not normal...but the man is a Samurai/Ninja, not a South-American Warrior Priest. I think the reason that the Tekken and SC Yoshi are so similar is because they are the same person. Dinaga posted this theorem originally. Yoshi's sword, Yoshimitsu, may contain the actual spirit of the leader of the manji clan, and the spirit is carried from body to body. PLease, Dinaga, assist me in this explanation. 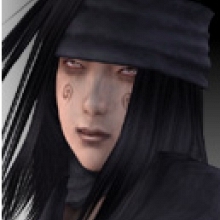 Manji clan member : I think the reason that the Tekken and SC Yoshi are so similar is because they are the same person. Dinaga posted this theorem originally. 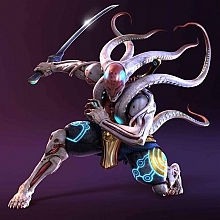 Yoshi's sword, Yoshimitsu, may contain the actual spirit of the leader of the manji clan, and the spirit is carried from body to body. PLease, Dinaga, assist me in this explanation. Aye, I'll be knowin' that, but I found it odd that they have gotten very similar all of sudden. T3 Yoshimitsu acts nothing like SC Yoshi (well, not if you ask me), I just feel that the traits have become clearer from game to game. Even though "Shiki soku ze kuu" has been heard quite long time, the phrases actually "came" with T4. The ever-wonderful kabuki-stance came with T5, as well as more phrases and similar movements - and I don't mean the fighting movements. 'Course, might as well be wrong. I just woke up.